What's the highest price . . . . . . . ? Is it true that Van Gogh . . . .? Which painting is the only one that . . . . .? Van Gogh's last painting? Was it . . . . ? Listed below are some of the most frequently asked questions that I receive via e-mail. I'm sent a great number of interesting and often challenging questions every day (some of which now appear on my Online Forum page). Q1 I believe that I may own a Van Gogh work/print myself. How do I go about getting it authenticated? A1 First of all, if it's a print/poster, then it would be best to contact the company that produced the print. For the record, no Van Gogh print--regardless of age or background--has any substantial monetary value. If you think you might have an original Van Gogh art work, then the best course of action would be to contact the Van Gogh Museum via this link that details their authentication procedures. Q2 My homework is late! Send me information on Van Gogh's style NOW!!! How did Van Gogh affect art? and what was his style? A2 I don't know how many times I've received these types of questions. Terse, vague and, worst of all, with a deadline. I'm always more than happy to answer any questions that I can, but the old "Help me finish my homework" queries are generally met with a polite, but firm "Try your local library" response. Q3 Hey! You claim that your site includes 100% of Van Gogh's work! But I can't find the painting The Flying Fox! Why don't you include this work? Your site isn't complete at all. A3 Without question, this is the one question that drives me the most crazy. I state, for the record, that my Gallery is 100% complete (thousands of hours of work can attest to that). It's just that often the naming of Van Gogh's works has no consistency from one reference to the next. Even the two catalogues raisonnés differ in terms of what the works are called. The Flying Fox is also called Stuffed Kalong (a kalong is a type of Indonesian bat). Many of Van Gogh's works are known by different names. If you can't find the work you're looking for, then please feel free to drop me a line and I'll point you in the right direction, but don't assume that my site is incomplete. Q4 Can you tell me what Portrait of Doctor Gachet sold for at auction? A4 On 15 May 1990 The Portrait of Doctor Gachet was sold within three minutes for $82.5 million U.S. at Christie's, New York. The new owner was identified as Ryoei Saito, Japan's second-largest paper manufacturer. The Art Newspaper recently reported that the painting was recently re-sold to a private, non-Japanese collector after Saito's death in 1996. Q5 I notice in the table above that you have two columns with the headings "F" and "JH". I've seen this throughout The Vincent van Gogh Gallery. What do "F" and "JH" stand for exactly? A5 The "F" and "JH" designations refer to specific catalogue numbers assigned to a Van Gogh work. In 1928 Jacob Baart de la Faille (F) compiled the first complete catalogue of Van Gogh's works (a catalogue of an artist's complete works is called a "catalogue raisonné"). It was updated by the Van Gogh Museum in 1970. Another catalogue raisonné, this one compiled by the Van Gogh scholar Dr. Jan Hulsker (JH), came out in the 1980s. The Hulsker catalogue was updated in 1996. The De la Faille numbering system orders the paintings first and then the drawings and watercolours after that, whereas Hulsker combines all the works together (regardless of their medium) and orders them chronologically. Q5a Okay, so that explains the F and JH headings, but I also notice that some of the F numbers have a "v" or an "r" after them. What do these stand for? A5a Occasionally Van Gogh would use both sides of the canvas or paper for his paintings and drawings. When he did this, then the De la Faille catalogue gave both works the same catalogue number, but would add an "r" ("recto", meaning front) to one of the works and a "v" ("verso", meaning back) to the work on the reverse. Jan Hulsker didn't use the recto or verso designations, but rather gives each of the works a unique number. Q6 What is the full story of the "ear" incident? A6 On the evening of 23 December 1888 Van Gogh and Paul Gauguin had an altercation in which Gauguin later claimed that Van Gogh threatened him with a knife. Although this account had been accepted for years, today it's generally considered to be apocryphal--a fabrication conjured up by Gauguin, perhaps in an attempt to appear more sympathetic. Later that evening Van Gogh returned to the "Yellow House" in Arles where he lived and mutilated himself. Holding the open razor in his right hand, he had sliced through his left ear; starting high at the back and hacking downwards so that all the lower part of the ear had been chopped off. This had left part of the upper ear still attached as a hideous flap of flesh. Van Gogh, then wrapped the ear in cloth and made his way to a favourite brothel where he presented this "present" to a prostitute. The police were called in and Van Gogh was subsequently hospitalized. The severed tissue of the ear was placed into a jar of alcohol in case it might be needed as evidence. Some months later it was thrown out. Note: A final word on the ear incident. A number of people have written to me asking "If Van Gogh mutilated his left ear, then why do his two self-portraits with bandaged ear paintings show his right ear bandaged?" It's a good question and I generally respond to it with a small riddle: the answer is as clear as your own reflection in the mirror . . . . .
Q7 I've heard that Vincent only sold one work in his lifetime. Which one? 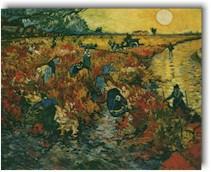 A7 It's a popular story that the only work Vincent van Gogh sold in his lifetime was The Red Vineyard (now in the Pushkin Museum in Moscow). The De la Faille catalogue raisonné (1970, page 221) says that The Red Vineyard was purchased by Miss Anna Boch for 350-400 francs. Still, there is some evidence that Vincent sold more than one work during his lifetime and this is discussed in the Online Forum section. Q8 What exactly was "wrong" with Vincent? I mean physically and mentally? A8 It's a difficult question and one that's unlikely to ever be fully answered. 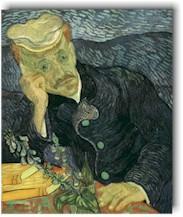 Vincent had a history of physical problems (due, in part, to his poverty and the fact that he was often malnourished). Vincent was also addicted to absinthe, a dangerous narcotic drink popular in the late 19th century. Speculation as to the cause of Van Gogh's physical problems include syphilis, tinnitus, lead poisoning, Meniere's syndrome and--the most commonly accepted--a form of epilepsy. There has been some discussion, too, that Vincent was the victim of "bad genes". Vincent's family wasn't of strong stock--both of his brothers died young and his sister, Wilhelmina, spent most of her life in a mental asylum. The subject of Van Gogh's illness is discussed in further detail in the Online Forum section. There's also a very good summary of the theories behind Van Gogh's illness on Wikipedia. Q9 I know that Theo died only six months after Vincent, but what did he die of exactly? A9 After Vincent died in 1890, Theo suffered from a complicated kidney infection. Recent evidence suggests that Theo may have contracted syphilis. He checked himself into a sanatorium shortly after that. Camille Pissarro wrote to his son Lucien: "It appears that Theo van Gogh was ill before his madness; he had uremia. For a week he was unable to urinate . . . .". By early 1891 Theo had a physical breakdown. He had a weak heart and then suffered a stroke which finally paralysed him. He passed into a coma and died a few days later. Q10 How do you pronounce the name "Van Gogh"? A10 The pronunciation--it's difficult to put into words. The "Van" is a bit like "Fen" with the V sounding like a half V and half F. The "a" isn't quite like a short "e", but it's softer than North Americans pronounce it. The Gogh--it's tricky. The first G sounds a bit like a guttural H, the "o" sound stays the same pretty much the same (but not as harsh sounding as the "o" in "go") and the final GH is sort of like a guttural CH, like in the name Johann Sebastian Bach. Note: A visitor to the Gallery was kind enough to provide a very detailed, in-depth explanation of the pronunciation of "Van Gogh". Q11 I've heard that Wheat Field with Crows was the Van Gogh's last painting. Is that true? A11 In his 1996 catalogue raisonné The New Complete Van Gogh: Paintings, Drawings, Sketches, Jan Hulsker suggested that Van Gogh's last two paintings must be Daubigny's Garden and Cottages with Thatched Roofs. More recently, however, B. Maes and Louis van Tilborgh maintained that Van Gogh's final painting was Tree Roots and Trunks (‘Van Gogh’s “Tree roots” up close’, Van Gogh: new findings, Van Gogh studies, no.4, Zwolle and Amsterdam 2012). The latter conclusion is the most compelling. Q12 I want to learn more about Van Gogh's painting of a man screaming (shown at right). 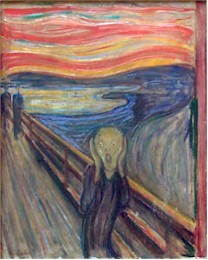 A12 Vincent van Gogh didn't paint this famous work (called "The Scream"), but rather a Norwegian painter named Edvard Munch. For more information about Munch and many other painters and their works, then I would recommend a visit to The Artchive. Q13 I'm looking for a Starry Night bed cover . . . a Sunflower shower curtain . . . an Irises tea cosy . . . etc., etc., etc. Can you tell me where I can find this? A13 You can order prints from Art.com, but I have no information regarding any other Van Gogh-related gift products. Q14 I love Don Mclean's song "Vincent" (also known as "Starry, Starry Night") and am curious about the lyrics. What does "the silver thorn of bloody rose" mean, for example? Can you explain the meaning and symbolism of Mclean's song? A14 Music and art are very much alike in that there are often no clear cut interpretations of a work. Mclean, who was supposed to have first written the lyrics to "Vincent" on a brown paper bag, said that through his song he wanted to "paint with words--descriptive and haunting." As to precise interpretations of the meaning of the lyrics, the best thing I can suggest is to visit http://www.don-mclean.com. The site has a huge amount of Don Mclean information and, for those interested in the lyrics to "Vincent", provides an "online fan forum". If you go to "Questions and Answers" and then to the second page of topics there's a specific category about the "Vincent" lyrics. Sharing their thoughts about these lyrics are Gwendol, a long time friend of the Van Gogh Gallery, and Ray.